Salem, Massachusetts, a city located 30 minutes from Boston and one that everyone needs to explore this spring. Come along as I take you around Salem and share with you the best hotels, restaurants, and things to do in this bewitching town that deserves more than just an October visit! Salem, Massachusetts has been one of New England’s richest destinations for over 400 years and granted, it’s most known for the Salem With Trials of 1692 but I’m here to tell you, there’s so much more to Salem than witches although the history definitely is respected. 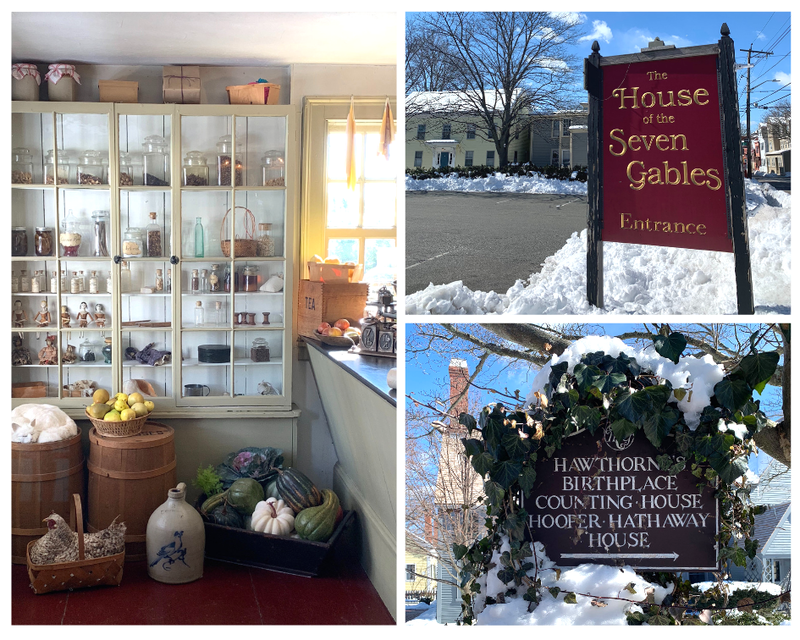 Between the literature, architecture, maritime heritage, military history, culinary experiences, and more, Salem has so much to offer a traveler and even more so if you’re a foodie traveler like myself! With over 20 hotels, inns, and bed & breakfasts to choose from in Salem, there’s an accommodation to fit everyone’s needs and desires. Below, we’re sharing our top three options for staying in Salem that you would love! A vibrant and one-of-a-kind accommodation on the North Shore of Boston, this 44-room boutique Salem hotel is in the middle of the action on the bustling Essex Street pedestrian mall in the city center and that’s one of the many reasons my husband and I love it! The location was perfect to get around day and night, with restaurants, shops, and things to do close by! Housed in a former high-end clothing store space, Salem MA hotel features “mid-century modern décor with vintage, retail-inspired touches that embrace its stylish past”. We stayed in a King Deluxe, a spacious and comfortable 1st-floor room that featured a plush king bed, a gorgeous dark blue tile bathroom, and all the amenities you’d love in a boutique hotel. Part of the Lark Hotels brand, The Hotel Salem is gorgeous around every corner! 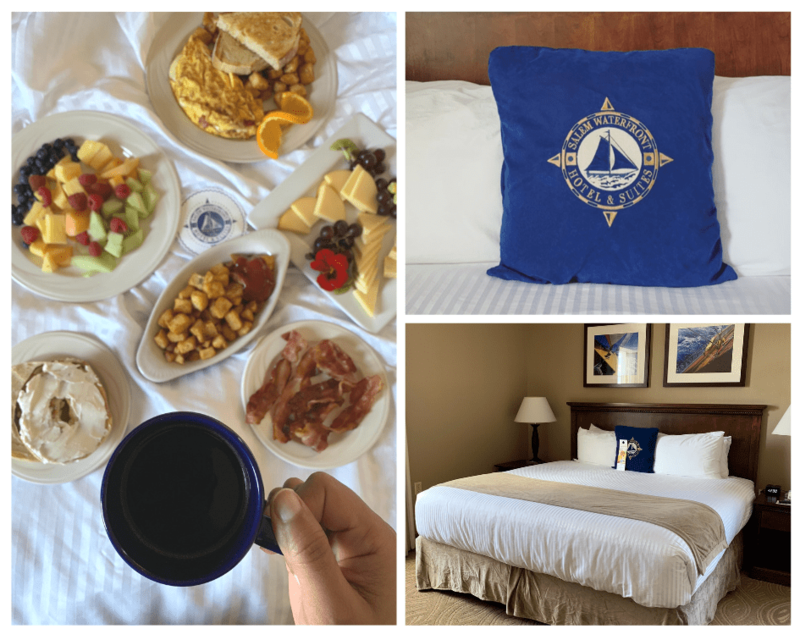 Nothing better than a hotel with all the amenities and this Salem hotel has them all: indoor heated pool, marina, onsite dining, fitness facility, free wireless, and onsite complimentary parking. Not only that, but their room service which we had a chance to experience, is out of this world as you can see below! We loved the location of this hotel because it was close to a neighborhood called “The Point”, where not only there are impressive murals around it, but it is heavily populated with Dominicans! I was incredibly happy to discover a Dominican restaurant around the corner from the hotel and the art along the way is incredibly inspiring. Like I’ve mentioned, Salem is rich in history and The Merchant hotel, named for and paying. 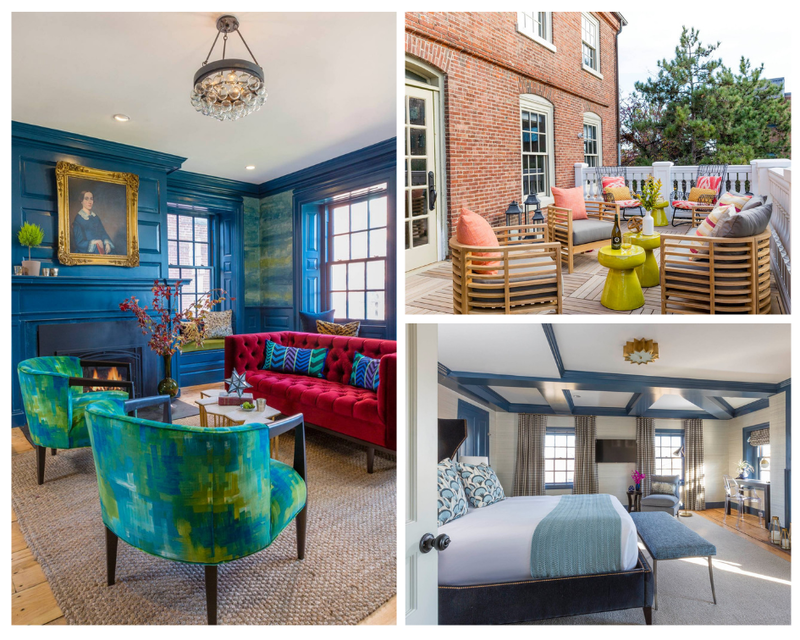 homage to Joshua Ward, the post-Revolutionary War sea merchant and privateer who commissioned the stunning federal style building that today houses the Salem boutique hotel, offers just that. The rooms, like all Lark Hotels, are gorgeously decorated, but the best part is the location of this hotel – steps away from the best shopping, eating, and drinking in Salem, you’ll love to discover this area of town. Stop by HausWitch for some modern witch shopping and dine at Adriatic for some delicious Mediterranean fare, both less than a 30 second walk from this hotel! Breakfast is the most important meal of the day and in Salem, it’s also incredibly delicious! Salem has a variety of restaurants that offer breakfast, everything you need from a quick latte on the go to a full sit down meal. Whether you’re looking for pancakes, waffles, eggs Benedict, or the best cortados in town, I’ve got you covered! Established in 1925, the historic Hawthorne Hotel is situated in the heart of Salem, and a proud member of the Historic Hotels of America. You’ll be stepping back in time but. at the same time experiencing modern amenities and service at Nathaniel’s, where I dined early morning while in Salem. Their breakfast menu has everything you’ve ever dreamt of and more: eggs Benedict, breakfast wraps, omelets, fresh baked goods, pancakes, and waffles. A short stack of buttermilk pancakes with fresh strawberries, drenched in warm genuine maple syrup and a dollop of orange-honey butter and I was in heaven. The Classic Eggs Benedict where impressive and perfectly cooked, served on a warm toasted English muffin, delicious Canadian bacon, and alongside, the most savory and delicious breakfast potatoes and peppers. On Sundays, they have a Sunday Jazz Brunch, worth checking out as well! A bohemian outpost right in Salem, Gulu-Gulu Cafe is a must for breakfast, not only for the good food but the good vibes! We ordered The Lumberjack, which consisted of one Belgian waffle, two scrambled eggs & three strips of bacon stacked up with maple syrup and it might have just been the perfect breakfast bite. I’m a big fan of combination sweet and savory for breakfast, so having a sweet Belgian waffle as the base for the savory eggs and bacon was quite genius. They have some great vegan options as well, and their espresso drinks are delightful – one of the specials was a sage raspberry latte, a creative and tasty morning coffee drink! Lunch in a new town or city is always exciting – and mind you, always necessary after a morning of exploring and walking around Salem. 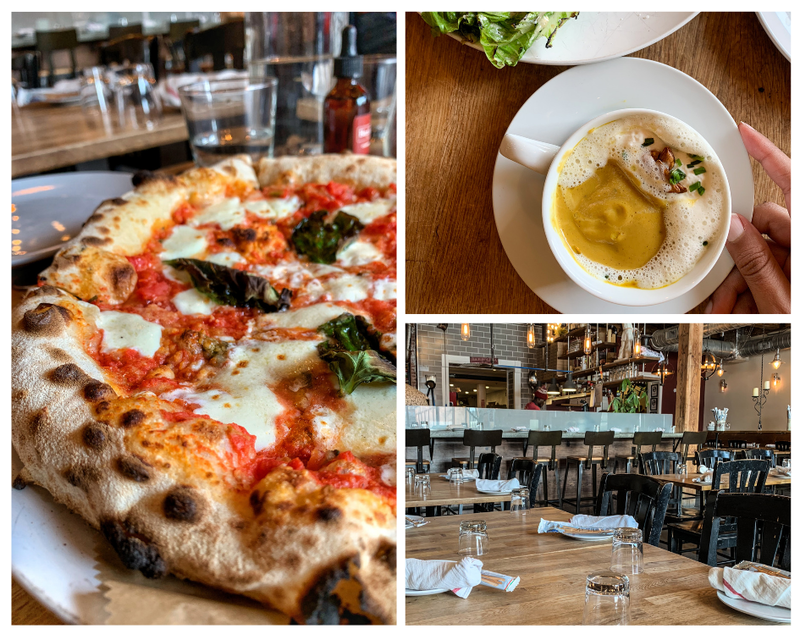 Below are just three of our favorite stops we made for lunch in Salem – seafood focused, with a little Italian thrown in for good measure! 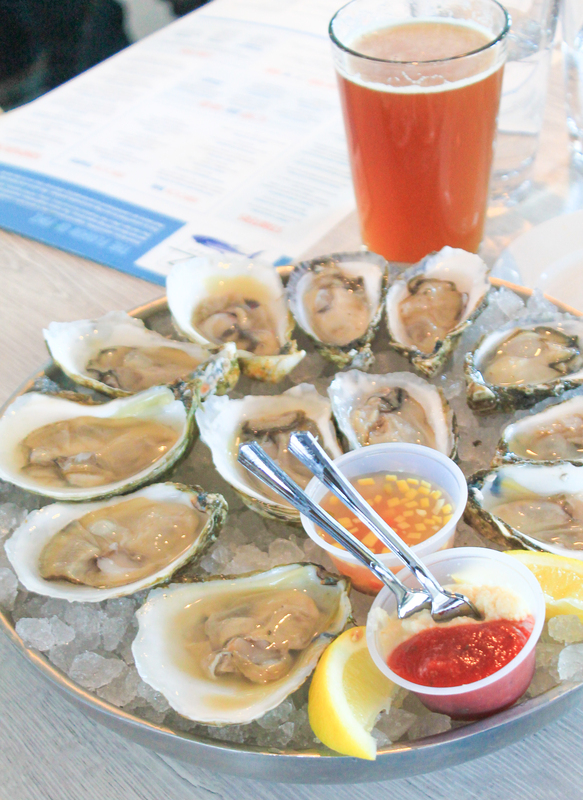 For those visiting Salem from outside of New England, you need to make sure to get as much authentic New England seafood as possible, with local catch of the day specials, oyster and raw bars, and fish markets. Turner’s Seafood offers that and more, in a gorgeous restaurant setting that’s both upscale and casual. That day, the soup special was a tuna chili, something I had never heard of but let me just tell you, it was SO delicious I can’t wait to recreate it at home! 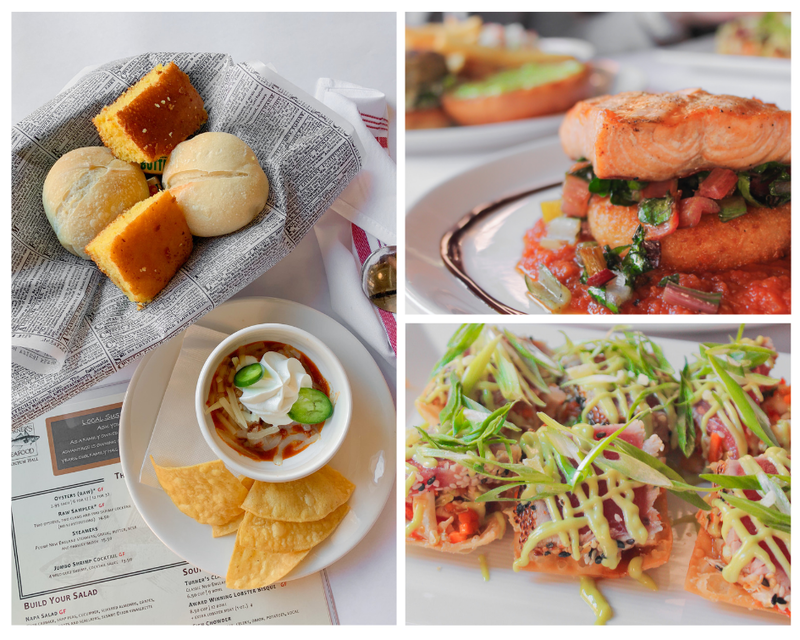 Along with that, we ordered a variety of dishes but all focused on their delicious seafood: a salmon entree atop a parmesan risotto cake, a tuna wonton appetizer that was creative and flavorful, and a tuna burger that was bright with color and texture. A must for lunch, this family-owned restaurant really blew us away. To keep with that seafood love, one of the days we were in Salem we had lunch at Finz Seafood & Grill and goodness gracious, was it divine. The raw oyster offerings were just so fresh and delicious, the sushi was a work of art, and their hot buttered lobster roll was in the top five rolls of our life. Plus the atmosphere was bright and airy, making us wish we could come back in the summer to experience it! I’m married to a pizza aficionado so wherever we travel, we find the best pizza shops and dive into eating all the pizza and that’s what happened at Bambolina, home to hand crafted, wood fired pizzas. Italian “00” flour, San Marzano style tomatoes, fresh mozzarella and a 925° hand made wood-burning oven imported from Italy make this the best pizza you’ll ever have. We went with the classic Margherita because that’s the best way to enjoy this hand crafted pie – the simpler the better! We also tried their grilled Caesar, with romaine, oversized croutons, delicate white anchovy, and parmesan cheese; Butternut Squash Soup with toasted pumpkin seeds and a maple Chantilly. It was all to die for. Dinner might just be my favorite meal of the day. Why? No reason but I just love going out to dinner at places that aren’t super fancy yet serve up quality meals. I love ordering a little of everything to try the entire menu at times, since dinner menus tend to be more expansive than breakfast or lunch. Salem really delivered on the dinner options and below I’m telling you all about them. I still daydream about this dinner because it was hands down FANTASTIC. 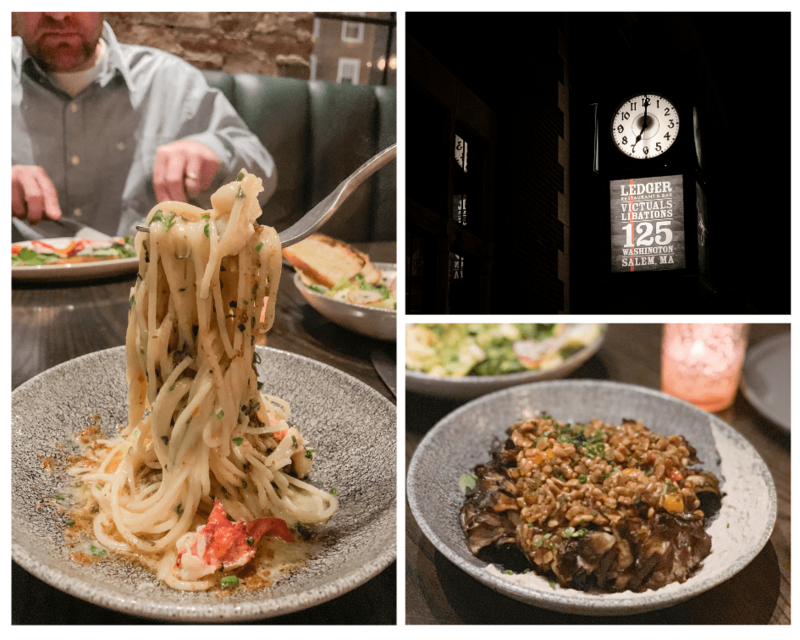 Ledger Restaurant is owned by Matt O’Neill, a good friend that used to work at the club with my husband years ago and now has two incredible restaurants (one in Salem, one in Lynn). The kitchen is led by executive chef Daniel Gursha and his team really makes so incredible food. Described as “a progressive New England concept, where traditional 19th-century dishes, cocktails, and techniques will be elevated with 21st-century resources”, Ledger had an outstanding menu where we ordered almost everything: charcuterie board, carrot ginger salad, hen of the woods wood fired mushrooms, spicy pork belly, lobster scampi, day boat scallops, wood fired chicken, and a yodel cake for dessert. Seriously, come hungry and order everything. We visited Salem in March and weather in New England is always changing, so on the night we did a ghost tour, the weather was around 15F, so we were freezing our toes off! It was all worth it when we decided to warm up with dinner at Kokeshi. 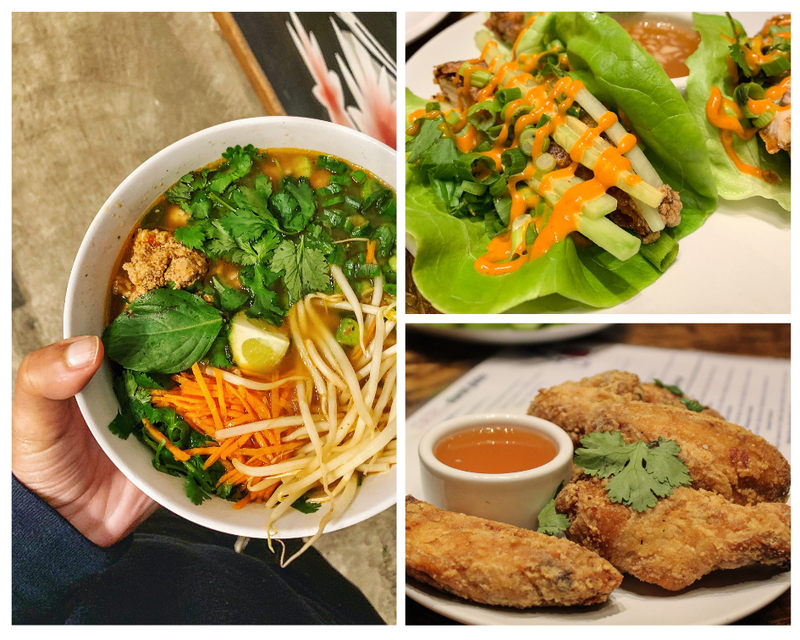 They’re serving up some of the best Asian street food, noodles, and soups we had ever had. Start with a few street food appetizers like their fried chicken wings with nuoc cham and their spicy pole beans with samba ranch and sesame. It was all divine! But on to the main course: Their Slow Roasted Pork Belly with Kokeshi Broth warmed us up inside out. The broth was so rich and delicious, we had to ask the chef all about it. Served with noodles, pickled daikon, soft egg, cilantro, and bacon fat panko, it was a slurping experience we will never forget. Visiting Salem in the. spring, and you’ll be surprised at the amount of fun activities to do! Accustomed to seasonal living on Martha’s Vineyard, Salem surprised us with the copious events and things to do, and we’ve listed our top three below. Those three don’t include a walking food tour with Salem Food Tours because that will be a full post on its own that I can’t wait to share! 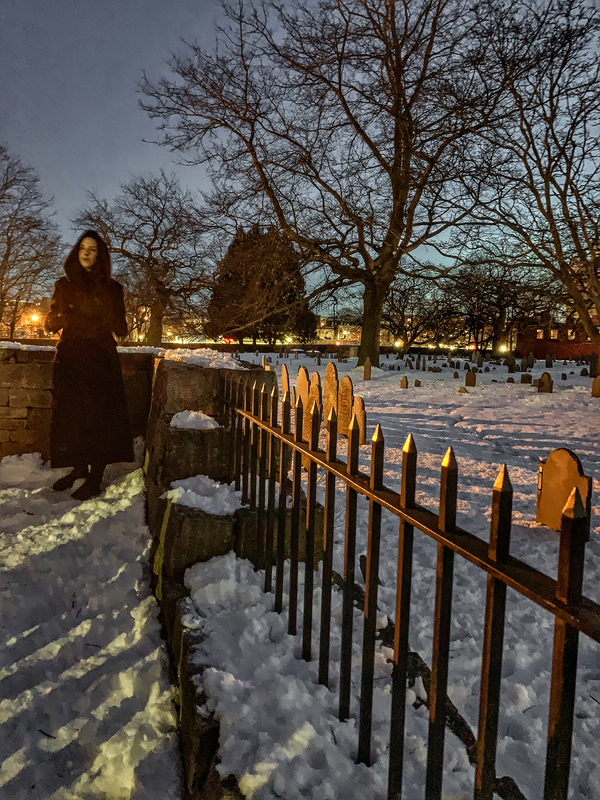 The Salem Ghost Tour at Night is one of the best tours I’ve been on – a 75 minute leisurely stroll through Downtown Salem where you’ll hear all about Salem’s history. Our tour guide, Cas, was incredibly knowledgeable about the haunted history of Salem and shared the information in a very approachable, non-sensationalist way. Yes, Salem is haunted and yes, it’s known for its witch trials, but it’s much more than that. No, there were no witches burned at the stake in the United States, and no, the 19 people the perished in Salem in 1692 were all innocents that were accused of being witches by their enemies. More than scary, it’s a sad history but one that deserves to be told. The House of Seven Gables, which inspired Nathaniel Hawthorne’s famous novel, is a great historical spot in Salem and we recommend doing the guided tours of the house. Admission to the house also includes access to Hawthorne’s birthplace, spectacular seaside gardens, and a unique museum store. Our tour guide, Jeff, was instrumental in us diving deep into the rich history of Salem and how Hawthorne played a part in it all. 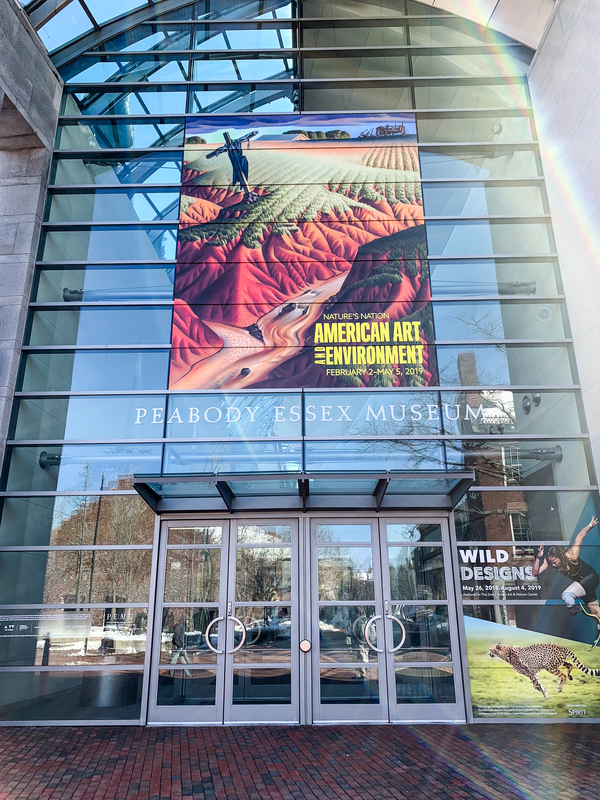 One of the fastest-growing art museums in the country, the Peabody Essex has some of the finest America art, Asian export art, photography, maritime art and history, Native American, Oceanic, and African art. Included alongside the museum is the Yin You Tang, a 200-year-old Chinese House that you can explore with a self-guided audio tour. It’s the perfect place to explore after a delicious meal in Salem! 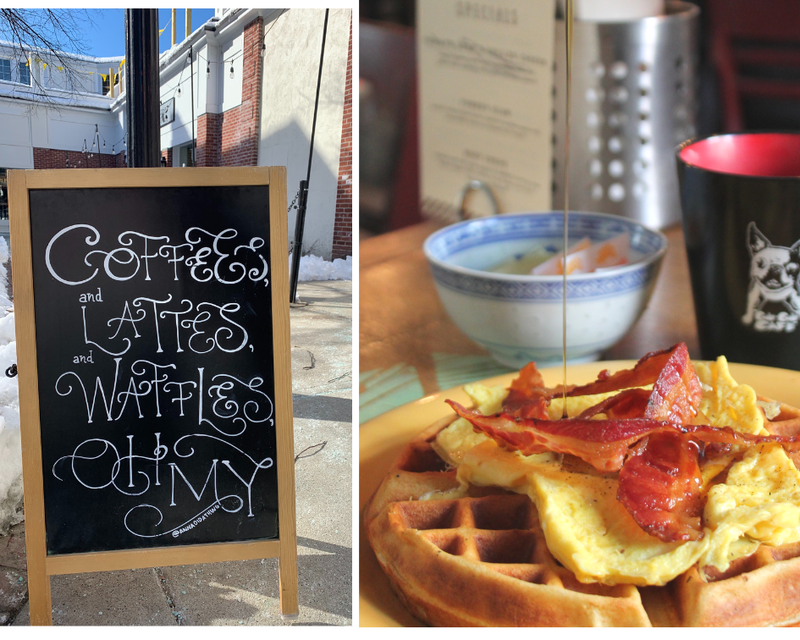 I hope this Foodie Travel Guide to Salem inspires you to take your own foodie trip to this gorgeous and delicious New England town. Best times to visit would be spring and summer, and we recommend staying for at least 3-4 days to be able to really get a taste of Salem! Disclaimer: Destination Salem coordinated our meals and accommodations. All thoughts are my own.